Holly Quate's new master bedroom has a custom-designed walk-in closet and master bath beyond the single doors. New deck outside the French doors. Ceiling beams and banana leaf wallpaper create a tropical style. The master bath has brown glass tub tile, pebble floors, porcelain tile walls, and oil-rubbed bronze plumbing fixtures. The window operates with a remote control and the floors are warmed by a timer. The spa experience is enhanced with music using an Echo Dot voice control system. Niches were made for added storage and decorative accessories in Holly Quate's new master bath. I met Holly in 2016 when she invited me to look at plans drawn up by Napa architect Wayne Waechtler. Her house was a 1,150 square-foot bungalow in a historic neighborhood downtown. It had been built in 1941 with an oyster shell and red rock stucco exterior. It’s the kind of house that takes some of us back to our childhood with fond and sentimental memories. As charming, enchanting and original as it was, it had a downside. The rooms were small and choppy, and storage space was extremely wanting. Holly needed more elbow room and bigger closets. Today, Holly’s bungalow has been transformed beyond recognition. Her small dining and living rooms have become one large space. Her kitchen has been opened up, reconfigured, remodeled, and updated. Her old sewing room at the back of the kitchen is now a designated dining room with easy access to a new, backyard deck. She can even listen to music and talk-radio using the Echo Dot voice-controlled system. Even with all the changes, however, the house has maintained its comforting charm. In fact, Napa general contractor Dan Knego preserved the kitchen’s old ogee-shaped arched doorway as a sentimental nod to the original architecture. The house’s footprint has increased by 425 square feet to accommodate a new master bedroom suite and a customized, walk-in closet. The bedroom also opens to the new backyard deck with a pair of French doors. Holly had a clear vision of her spatial and logistical needs but could not decide on the style in which they would take shape. As I mentioned, she likes many. This was complicated by another concern. Holly did not want her home to look boring. She wanted pop, pizzazz and personality. She also feared that bringing in a designer would result in a neutral, minimalistic, formal, and “designer-y” outcome. Holly’s predicament was not unusual. Many homeowners face the same challenges and questions. Should a home have just one style? If so, how do homeowners choose it? If not, how do they combine them? Most people have a mix of purchased and inherited furnishings. These furnishings rarely blend into a cohesive design package let alone relate to the architectural style of the house. It’s easy to understand the pressure homeowners feel when making such consequential decisions. They’re making substantially emotional and financial investments and don’t want to make a mistake. Holly’s decisions would impact about 75 percent of her house. Her head was spinning. In the early stages, we reviewed dozens of photos on Houzz.com. I noticed her consistency in choosing the same three themes—Art Deco, Modern, and Craftsman. But, every once in a while, she would toss in something unexpected. Images of darkly-stained wood furniture and palm trees that would transport me to the West or East Indies. Now my head was spinning. I could envision a way to create an Art Deco-Modern-Craftsman home as they share a few characteristics like no-fuss, straight lines. But I had no idea how to incorporate these surprising tropical touches. Fortunately, I wouldn’t have to. At one point, Holly showed me something that she was unwaveringly excited about: banana leaf wallpaper. No doubt about it, she wanted to use it in her master bedroom and bath, and we would. This was a pivotal decision in that it became ground zero and a guide for the entire house. The other three styles were out. The wallpaper served as a way to keep us focused. We’d keep Paul Gaugin’s French Polynesia in mind. Holly did not automatically stop liking the other three styles. Each time that she’d bring them back into the discussion, I’d redirect her focus back to the wallpaper. It was our foundation, our pop, pizzazz, and personality, and adding anything contrary in style would dilute its strength. The once-hidden kitchen was now open and centrally located. And, it’s where Holly made another critical selection. She wanted color and had mango-sunset-orange in mind. A variegated tile from McIntyre fit the bill perfectly. We used it as a backsplash and took it to the ceiling on two walls. 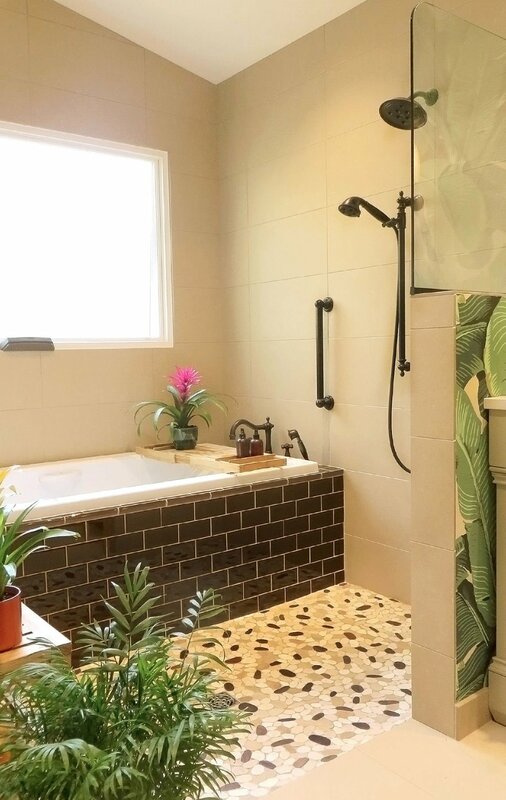 The tile and wallpaper had created just the right amount of impact and, therefore, helped me justify a neutral cream and brown color scheme for the rest of the house. It’s a palette that color-loving Holly would ordinarily reject. But as she focused on the dramatic features we had established, she understood the need to balance the remain decisions with simplicity. Yet, simple did not have to mean boring. Cream cabinets, countertops, walls, and ceilings were the perfect background to highlight dark brown doors, window shades, glass tub tile, and ceiling beams. Holly had faced many decisions during the past two years. But by staying focused on the style of key elements, she created a strong design with just the right amount of pop, pizzazz and personality. Before and after photos of this project can be viewed at www.plcinteriors.com or email me for the video. Patti L. Cowger is an award-winning Napa-based interior designer and owner of PLC Interiors. For more information about her design services, visit her website at plcinteriors.com call (707) 322-6522; or email plcinteriors@sbcglobal.net.